Stretch your IT budget even further with the “Buy 5 | Stream Live” promotion! Between now and July 27, 2018, when you purchase 5 or more high-density* Meraki APs (MR52, MR53, MR53E, MR84 only), Cisco Meraki will give you a Meraki security camera with a 3 year cloud management license absolutely free! This is a great way to add extra value and extra security to your business. As always, new and existing Meraki customers receive 24/7 support, all future firmware updates, and new feature releases included in their product license. See here for full terms and conditions of the promo. Meraki expects to be accepting final orders for this product through April 28, 2018. However, the final date will depend on the availability of stock and, at Cisco Meraki's discretion, the actual end-of-sale date may be earlier than April 28, 2018. End-of-Support date for this product will be April 28, 2025. Total cost of ownership (TCO) isn’t a complicated concept. Simply put, it’s the sum of the upfront cost of a product or service and the direct and indirect costs incurred during its lifetime. Nevertheless, many buyers considering an IT infrastructure upgrade can fall into a pattern of using upfront cost as their key criteria. Not only does this inadvertently neglect potential products or solutions that may be much better suited, but in the long run may actually end up costing a lot more. For most organizations there are usually multiple stakeholders involved in the IT purchasing process with the number increasing with company size. Our first touch point with customers tends to be with the IT folks. Testing out Meraki first-hand, we’re always amazed at how quickly they fall in love with the technology. Naturally the IT folks are convinced, but the next step in the buying process is typically around gaining buy-in from the various other functions in the internal buying chain. The stakeholders in this stage are frequently non-technical and have their own KPIs to satisfy. At this point we’re often asked by customers and partners alike for stats or numbers to quantify how much Meraki customers are saving in operational costs. CNOS chose to deploy Meraki even though hardware costs were 15% more than traditional technology. CNOS was able to recover the difference in CapEx within 16 months over a 5-year comparison. Cisco Meraki is announcing the upcoming end-of-sale for the following product. The MR62 Cloud Managed Wireless AP has been replaced with the functionally equivalent MR74 Cloud Managed AP. They expect to be accepting final orders for these products through November 15, 2017. However, the final date will depend on the availability of stock and, at Cisco Meraki's discretion, the actual end-of-sale date may be earlier than November 15, 2017. End-of-Support date for these products will be November 15, 2024. Meraki Firmware versions and roll back functionality! Active since July - the long awaited ability to take control of the firmware your devices are running! Dashboard administrators will now be able to see firmware version numbers for all networks, as well as the recommended versions for each device type. Detailed patch notes will be available for all firmware versions. Administrators will be able to choose to upgrade any of their networks either to the latest stable firmware or to the current beta version, for easier access to new features. For 14 days after performing a firmware upgrade on a given network, administrators will be able to opt to roll back to the previous running version for that network. This allows for faster resolution to any issues encountered after an update. With these changes, dashboard administrators will have easier access to the latest capabilities and will be able to address potential issues as quickly as possible. They will also be able to work more effectively with our Meraki's Support team to troubleshoot and resolve problems. Still not convinced the cloud is for you? Read on. If the challenges involved in managing your employees’ bandwidth, security, and mobility needs are keeping you awake at night, we’ve got some tough news: the rapid pace at which technology changes means those challenges won’t go away anytime soon. Implementing a modern IT infrastructure that’s able to support always-connected mobile devices, data-hogging applications, and “bring your own device” (BYOD) practices is no longer a “nice-to-have”—it’s a necessity. With cloud managed IT, managing and troubleshooting issues from anywhere is finally a reality. An IT administrator can quickly get alerted about a network issue, diagnose the problem, and devise a solution from any computer with internet access. For example, with cloud managed IT, an IT admin can quickly run a cable test on a cable running between a switch and an access point to determine whether the cable or the AP is at fault. Cloud managed IT doesn’t just help save time and resources; it unlocks entirely new capabilities that simply aren’t possible with legacy IT solutions. In order to maintain a secure stack that ensures high levels of productivity and uptime, IT needs constant visibility into network traffic, security threats, and device activity. Keeping security definitions and device firmware up-to-date is also crucial. Cloud managed IT makes it simple for IT admins to get a real-time understanding of what’s going on network-wide and to ensure that security threats are kept at bay. With a fully cloud managed infrastructure, IT admins can look at application usage on a per-client basis and enforce security policies at the firewall or access point level, all from one dashboard. Additionally, when threats arise, admins can rest assured knowing that the latest security updates have already been pushed to firewall devices, silently and automatically, over the Internet. This kind of visibility and automation significantly reduces the burden on IT while ensuring complete network security. The beauty of cloud managed IT is that every part of the stack can be controlled from a single management interface. This enables different elements of your IT infrastructure to work together in new ways. For instance, with every device communicating with one another and with the cloud, IT admins can view a complete network topology, updated live, and instantly troubleshoot issues with any device. As the demand on the network grows and new IT infrastructure is added, every new piece of gear can be managed from the same interface. This easy scalability makes cloud managed IT ideal for growing organizations with ever-increasing numbers of users, devices, and sites. Of course, one of the most important considerations when it comes to choosing which IT stack to implement is overall cost. 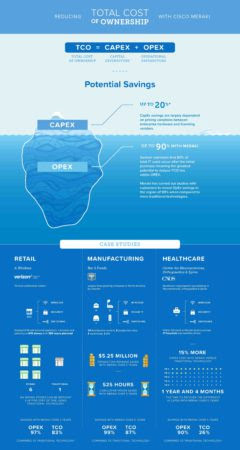 And while the cost of the initial hardware is certainly important, too many companies focus only on the hardware cost and ignore ongoing support and maintenance costs. The beauty of cloud managed IT is that the flexibility and ease-of-use inherent in the cloud managed model means much lower management costs over time, resulting in a much lower TCO over the span of a few years. As mentioned earlier, a cloud managed stack provides your IT team with extensive visibility into network performance, not to mention actionable alerts whenever there’s a hiccup. You’ll be able to proactively diagnose issues and manage problems before they impact your business; as the saying goes, “a stitch in time saves nine.” Additionally, with the cloud managed model, multi-site management is simple and straightforward. All of this means that the TCO of a cloud managed IT stack is much lower than that of traditional IT infrastructure—often by thousands of dollars. Once upon a time, on-site network controllers, command line interfaces, and manual firewall configuration were enough to keep a network afloat. But a creaky old IT infrastructure can no longer keep up with the needs of modern organizations. Embracing cloud managed IT presents significant advantages for admins who want to implement a forward-thinking IT infrastructure built to last. Enter Cisco Meraki, a leader in cloud managed IT. Meraki offers a full stack of cloud managed IT solutions—wireless access points, switches, security appliances, enterprise mobility management, telephony, and security cameras—all managed through the Meraki Dashboard. With Meraki, enterprises and SMBs alike have discovered the benefits of adopting a cloud managed stack.